When people think about coming to live in Colorado, their first thoughts most often turn to places like Vail and Breckenridge, and who can blame them? With beautiful mountainous terrain, plenty of recreational opportunities for active lifestyles, and a multitude of ways to stay busy all year long, both Eagle County and Summit County have proven to be great places to live. The winter is especially lively in these areas, and the following are ten of our favorite things to do here throughout the winter season. Apex Mountain School in Vail Valley offers classes for all sorts of different winter activities, but few are as enjoyable as snowshoeing through the gorgeous backcountry of the Colorado Rockies. 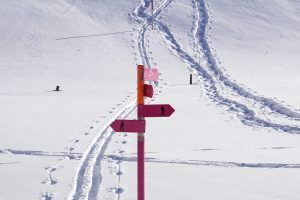 There are a number of sleigh rides available in Eagle County during the winter, but this route to Bearcat’s Cabin is great because it comes with a delicious dinner in Vail. Appenglow Adventures offers a really fun railroad tour all year long, giving patrons a great view of the mountain terrain from the comfort of a heated train car. Skiing has been a major part of this area’s history since Summit County’s first resort opened in the 1940s. Whether you’re ready to hit a black diamond slope or are just learning how to ski, there is a resort in the area to suit your needs. While at its loveliest in the summer, this outdoor botanical garden gives an awesome guided snowshoe tour throughout the winter, as well. Locals have their choice of ice skating facilities in the area, but this five-acre park in Silverthorne, CO is gorgeous and makes for a really fun day of family ice skating. At Frisco Adventure Park there is a giant snow tubing hill that is unlike anything you’ve ever experienced. There are routes for experienced tubers and amateurs, making it great for families or for thrill seekers. If you need an adult libation to warm you up in the cold, consider stopping by the Breckenridge Distillery, the highest-altitude distillery in the world! The only free chairlift ride in the area, the American Eagle Chairlift offers great views even for those people not interested in doing any actual skiing. Located in the old Bailey Building in the heart of Breckenridge, this is a great place to experience some interactive exhibits about the history of the area, and it’s open all year long! If all of this has you excited about the possibility of moving to Eagle County or Summit County, do not hesitate to reach out to The Smits Team, and we can help you take a closer look at properties all throughout this area. Unlike most parts of the country, winter time in Colorado does not mean just staying inside until April. There are so many great things to do in this part of the state!